As the near full moon flooded the landscape with its white light; runners, volunteers and organizers left behind an unbelievably quiet and relaxed night, welcomed the gracious host’s humble breakfast at the langar and lined up for their stake at the medal waiting on the other side of the finishing line. Under the guidance of BSF and with blessings of the Gurudwara’s Gyaniji, the runners – two of them experienced and the rest testing their endurance for the first time, set off almost on time, at 7:15am on 14 March 2014. 160Kms race start from Lakhpat. Seen in the picture are Gyaniji and the racers. Some of us from the organizing team were yet to be fully functional; not having slept through the night for various reasons. Yet, that didn’t stop the spring in our step and a smile that broadened each time a runner was visible on the horizon. It was possibly the best start to any of the Globeracers’ races. Little red and yellow ribbons tagged into the shrubs dotted the dusty, shrubby landscape. Looking right, left and forward to spot the next red ribbon, or a yellow one which signaled an upcoming change of route direction, I ran to catch up with the first set of runners who set off from Lakhpat, an ancient fort town. Our photographer beat me to the chase and was already clicking away to frame the first action shots of the race. 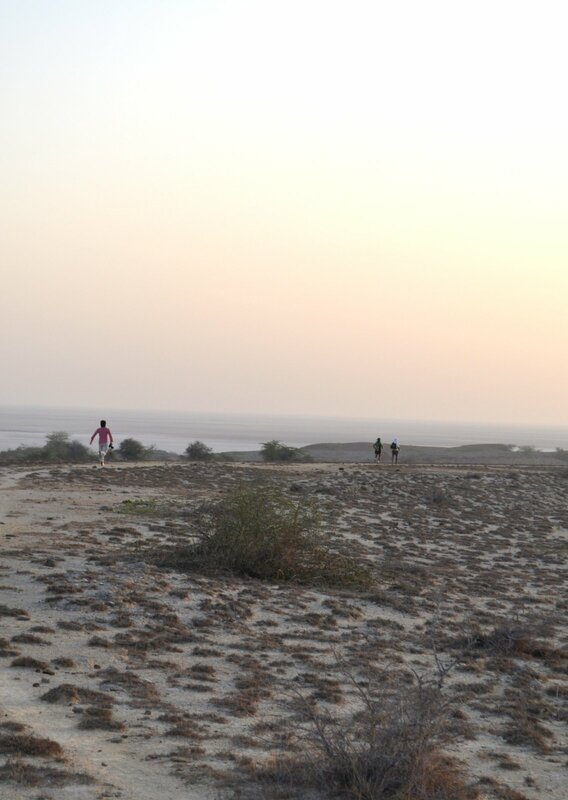 With the Arabian Sea in the background, the rising sun and fort Lakhpat, subject material was aplenty. A few quick dashes to find the right light and moment for a good image took us onto the portion of the route which skirted the Arabian Sea. It was breathtaking; literally and figuratively. Satisfied that the route markers were intact and that the runners were following instructions – to not lose sight of the next flag in the series of flags/ribbons that dotted a 160 km stretch in the jungle; we headed back to the jeep which would take us to Guneri, the first pit stop on the route. The trail part of the route we were on in between Lakhpat and Guneri ended and we were on the road shortly. We spotted a red flag on a pole. It was a good sign. Runners were bound to be on track with flags and ribbons intact. We came up to the turn that led us to the Guneri pit stop and realized there were no flags signaling the turn. Someone either removed it or the wind ripped it and carried it away. Either way, my heart skipped a beat. We were on an accessible road, but still. Losing the way for a long distance runner is a big chink in their armor, especially that early in the race, just about 10 km from the start point. Once at the pit stop, the folks assured us that the runners were just around the corner on the beach instead of the road, and have been directed on to the right path. As relief set in, we had breakfast prepared by the hosts. Then we set out to find the runners, along with the ambulance and doctor. 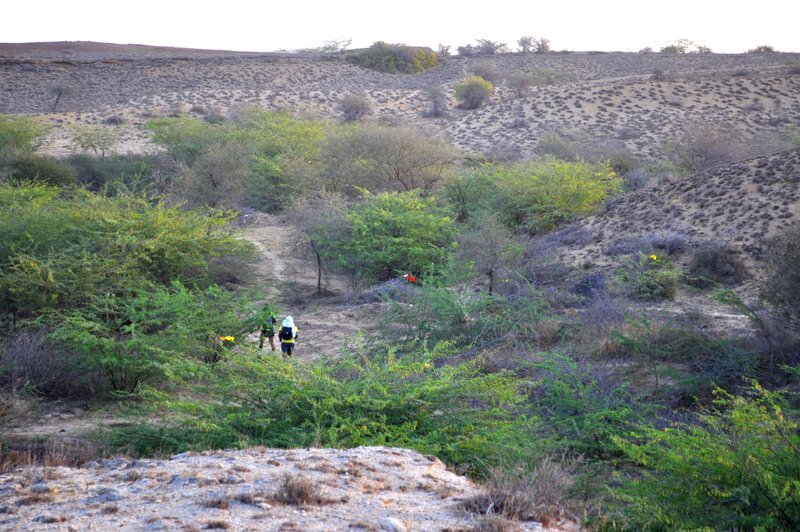 We tagged along in Doctor Thakkar’s jeep and redirected our vehicle to follow the ambulance, which was taking the long road to the next pit stop, as the trail was tricky for large vehicles without 4×4 functions. 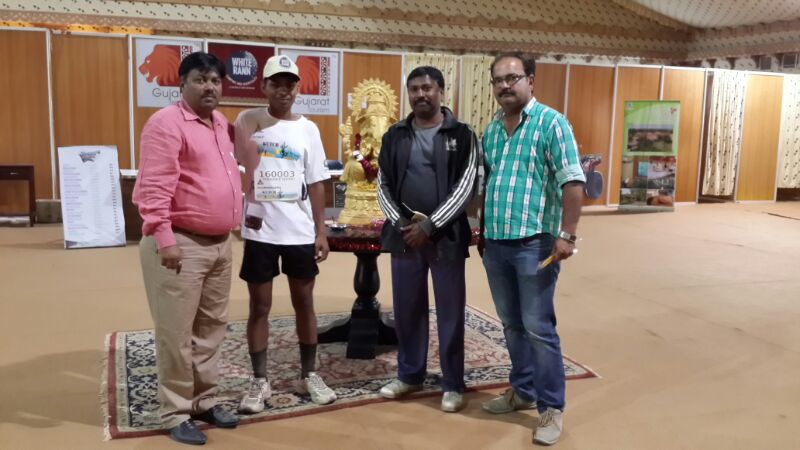 The runner from the BSF relay team, and Dhanaee Kumar, a karate student from Kutch, were consistently ahead and building an impressive gap between themselves and other runners on the 160km route. Being acclimatized to the weather didn’t hurt. Dusty/rocky trails and steamy hot wind didn’t slow their step. Without much needed gear such as a hydration pack and the bare minimum headgear, these two front runners pounded away on the trail to the point where we started to worry about the runners at the back of the pack. Could it be that they were lost or were we worried just because these two set a trailblazing pace that was unbelievable in those conditions? After an hour long wait, we headed back on the route and found Bhupendra and Breeze Sharma heading our way and looking strong. 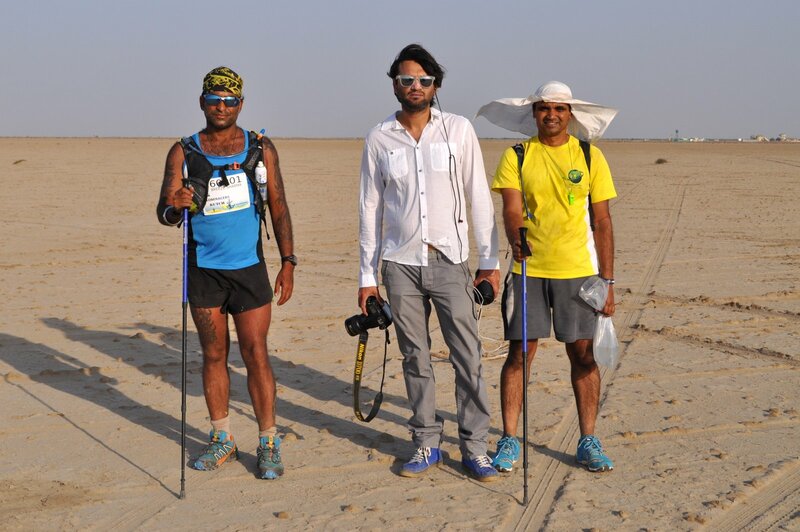 Bhupendra has run a desert ultra before, the Globeracers’ Thar Desert Ultra, and has experience to set and manage his pace as per the climatic conditions of the desert, its hot days and cold nights. So I assured rest of the team with me that these two knew what they were doing, and as per the race format, which is semi-supported, we didn’t need to monitor them every step of the way. We replenished their stock of water and food, and moved on to find the front-runners and ensure they were receiving their supply of water and food. Doctor Thakkar, I must confess, was a pleasant surprise and great company; allowing us to laugh off any stress that we may have felt worrying about the runners. The sun was high up in the sky by then leaving no shade for runners to rest and cool off. Though the barometer would only say 38’C it certainly felt like a good 45 degrees. Saltpans and dry dusty trails were reflecting the sun’s heat and making it all the more unbearable. Throughout the morning and early afternoon, runners fought their urge to speed up and log some solid miles. Fast paced running in sapping heat is a sure shot route to dehydration and cramps, and possible DNF (Did Not Finish; any ultra runner’s worst nightmare). With the setting sun came a new set of challenges. Runners were to have made it through the toughest terrain before sunset, which would have brought them to the base camp location. With two runners still at the 56 km point at sunset, support at the aid-stations had to be extended and adjustments made to their timeline. 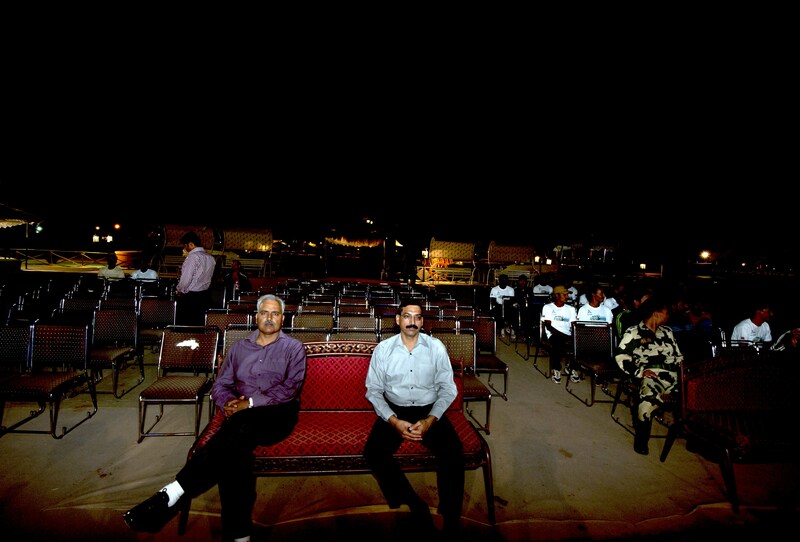 With only two of us who could be spared for the duty to ensure Bhupendrasing and BM Sharma made it through the rough terrain safely at night; realization dawned of a long night ahead and had us finding ways to ease off stress and making the best of the moon-washed desert landscape. 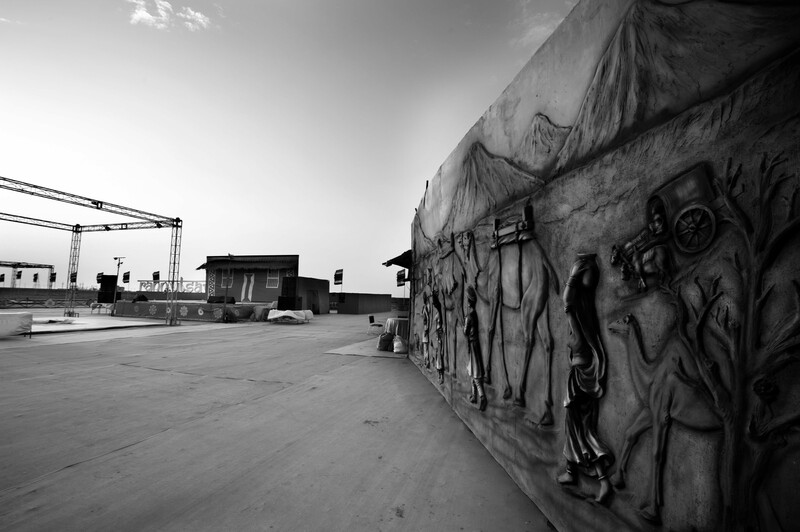 A ride on our famous Toofan’s roof, several pictures and munching on peanuts and channa, we waited. It’s interesting how time stretches in to the night when there is absolute silence and only that much one can do to not bore the colleagues. Our vehicle’s driver by then had been on non-stop duty, driving a non-power steered vehicle in a brutal terrain where getting stuck in the loose soil was always a possibility. He needed to sleep. There was also the worry of us falling off asleep and losing the runners. We stepped out of the vehicle, with instructions to the driver to take a power nap, and walked the brief stretch in the runners’ direction. This we repeated every few hours and the best outcome is the memory of a moonlit desert, with just cool breeze and sounds of crickets and foxes for company. Surreal it was and a lasting memory. We found them dozing off on the path and taking a break often until after a good meal near Udhma. Seen here are Bhupendrasing and Breeze Sharma having their dinner of aloo parathas, the best source of quick carbs, as vouched by Bhupendrasing that he was fully energized post this meal! A near full-moon night in the desert certainly with cool breeze was just what these runners said kept them going. Saify Naqvi, our photographer, with a great body of work to his name as a concept, abstract, portrait and travel photographer, was not just busy capturing some stunning images, and telling moments of the runners’ journey through the toughest, harshest and trying trail route, he was an absolute champ helping out the runners, talking them through some difficult sections of the route and jumping out of the vehicle to feed/hydrate them on the go. In his own words, this is the toughest shoot of his life, a 36 hours non-stop assignment! With Saify now at the steering wheel as the driver took a nap, we drove ahead to the Udhma post, which was the station before the Rann Utsav base camp. We breathed a sigh of relief knowing that help was around the corner and runners were going to be on an easier, clear path. Maybe we underestimated the exhaustion level of the runners. Bhupendrasing reached the Udhma post 15 minutes ahead of Breeze Sharma, whose pace had slowed down owing to huge blisters on the sole of his feet. With instructions from the guard at the post, and a route with a clear path, Saify and I decided to wait for Breeze Sharma also to be shown the route and ensure that he wouldn’t fall asleep somewhere en route and be exposed to possible snake or scorpion bites. Shortly after, with Breeze also making his way to the base camp, we moved ahead to find Bhupendrasing and led him to the base camp, from where he would set off to the next part of the race. After15 minutes of driving and it was clear that Bhupendra had lost his way. Unreal we thought and for both, Saify and me, the worst scenario was unfolding quickly. Though it was close to the base camp and there were a few factories around, it was still a marshy portion of the route and anything could go wrong. 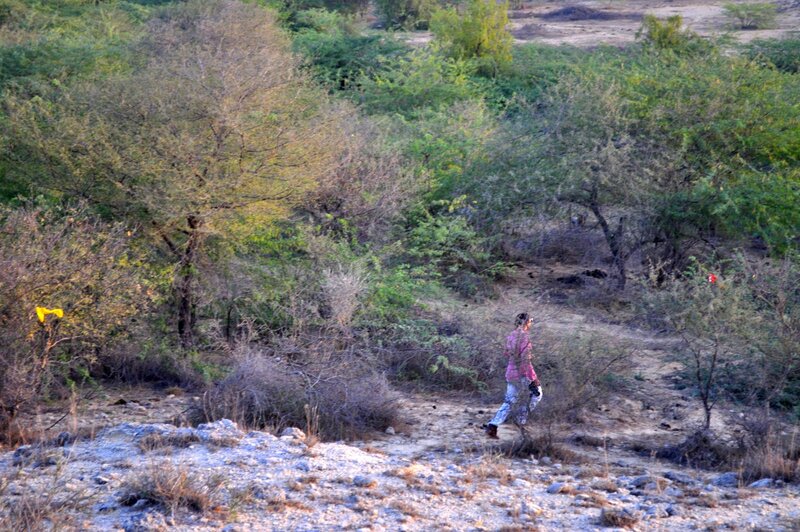 Saify, with his keen sense of these runners by then, was very sure where Bhupendra had taken the wrong turn. A few more kilometers down the actual road to ensure we looked for him long enough, and it was clear he was for sure lost. A quick u-turn on a tricky road, and we sped on to the path where Bhupendrasing could possibly be. We met Breeze Sharma on the way and ensured him that all was well. 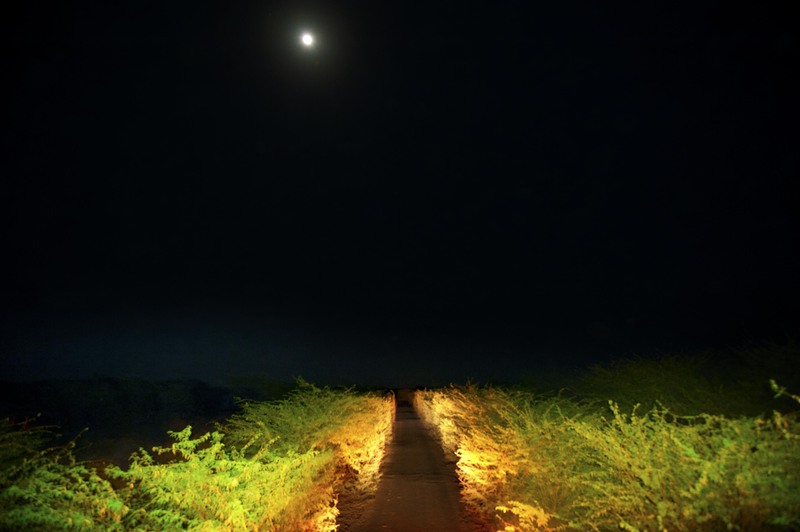 As we drove to the location where Bhupendrasing may have taken the wrong turn and drove up in that direction, we saw a couple of lights flashing from torchlights, and people speaking in excited tones. Saify quickly jumped off the jeep and ran to where they were standing, and as I made my way up to them, it was evident that the natives had spotted someone alien to them. Everyone in the region was aware of the race that was being conducted and were active supporters of the event. A few quick exchanges of the sighting, the gear Bhupendrasing was wearing and how they found him made it clear that we found our runner. From when we realized that we had lost him and to the time we found him, barely 30 minutes had passed. Those 30 minutes probably will remain with us for a long time for the amount of strain that was on the three of us, Saify, our driver Javed, and me. The cool and collected Saify Naqvi snapped once in those 30 minutes. No race director or crewmember can ever be nonchalant about losing a runner, and if they are, it’s best they never be part of another race again. We do every possible bit of planning to ensure a runner/crewmember is never lost. But, in the eventuality of that happening, one must be prepared to have the collective calm and patience to work through all possibilities and trace the missing person the quickest they can with additional resources if needed. In this case, what worked for all of us was the calm with each of us approached the next move though each of us had our own thoughts about where he may have taken the wrong turn, with three possible locations where he may have done so. We decided to start at the beginning and work forward. That worked. And, we are glad we are a good team. There was cohesiveness, camaraderie and absolute trust in each other to put runners’ safety ahead of anything, which is just what I would expect of my team. Globeracers has come a long way from being a single-person show to creating a self-sufficient and able team with shared planning and execution processes. Never ever lose a runner, and especially not in the Rann. Ensure every runner is accounted for at all times, and there is a pilot and a rare sweep vehicle at all times, with route monitors in between. 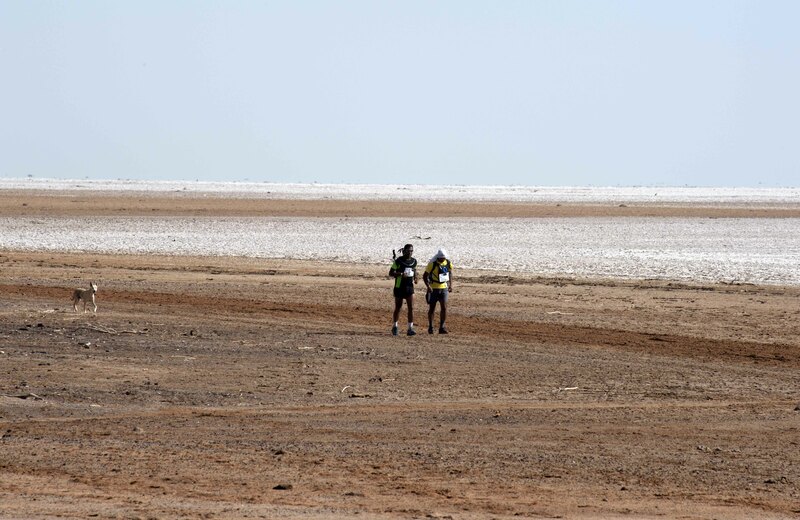 While we were bringing up the rear, the team at the base camp was receiving runners at the front, ensuring they either rested or continued on the route, for another 58 km to complete the 160 km distance. 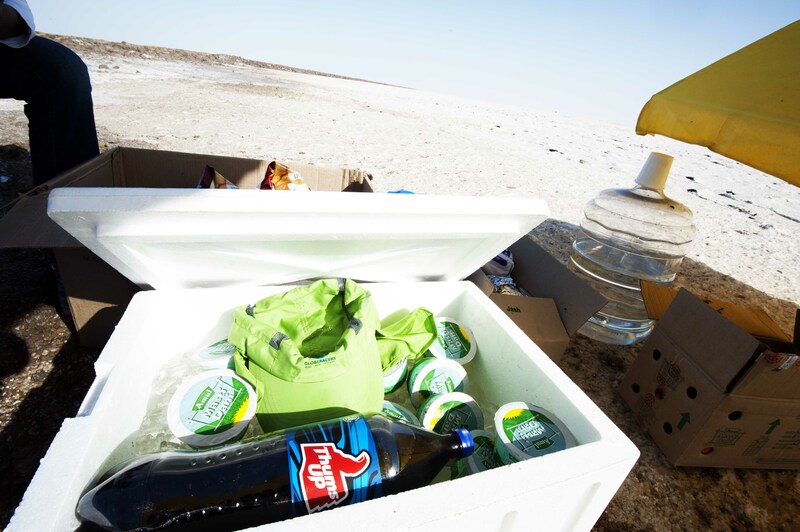 Our hospitality partners White Rann Camping and Hospitality created a warm welcome party for the runners at the Rann Utsav and ensured food and beverages were available to them as they entered the base camp aid-station. The BSF personnel were a great set of volunteers who provided nutritious food and cheer, and manned every aid-station on the route, which was just what the runners needed: a smiling face, some cold water and nutritious food to refresh, recharge and be ready to set out and put a few more miles behind them. 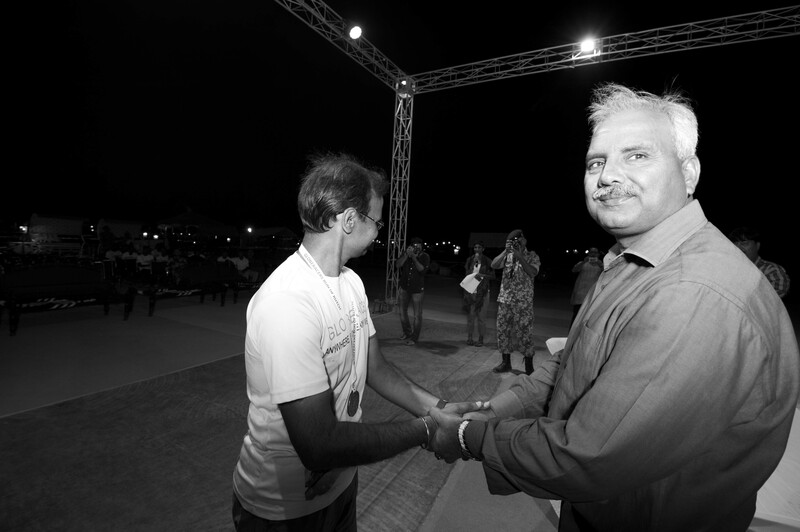 Runners welcomed and taken care of by able and awesome volunteers at the Rann Utsav after a hard and long day in the desert with another tough section of the route ahead of them. Picture courtesy Hitisha Mehta. Abhijith Yeole, our Operations Director, and volunteer Vineet Dhammi, were on the route, marking it with flags and ensuring the integrity of the route. Three days on the route in those hot conditions and exposure to dust and dry heat had not dampened their spirits. 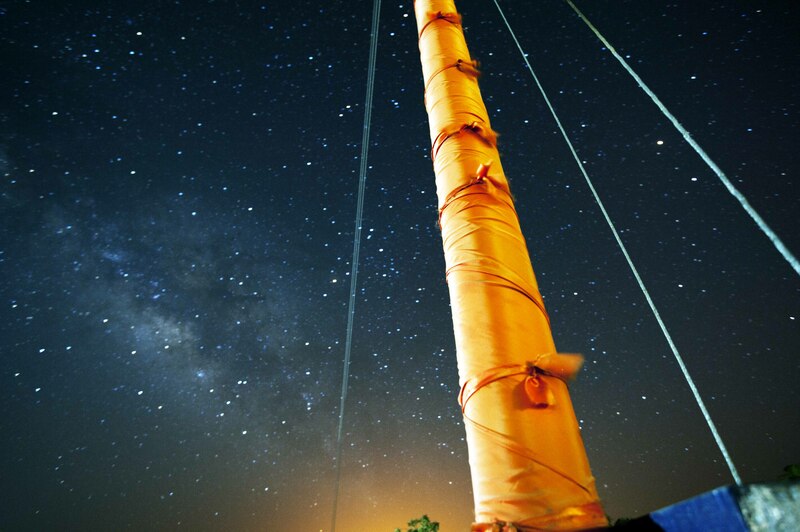 The vigor with which they worked throughout the race days, non stop for 48 hours, is most certainly the strength on which Globeracers races thrive and succeed in providing runners an experience they deserve. While Hitisha Mehta and Suneetha Prasanna ensured there were no glitches in planning the 25 km and 50 km aid-stations, and runners were taken care of with aid-stations every 4 km; local volunteers, BSF runners and supporters, and White Rann Camping and Hospitality contributed their time, resources and moral support so that the event had everything a runner needs to be able to conquer these harsh conditions in this remote region. 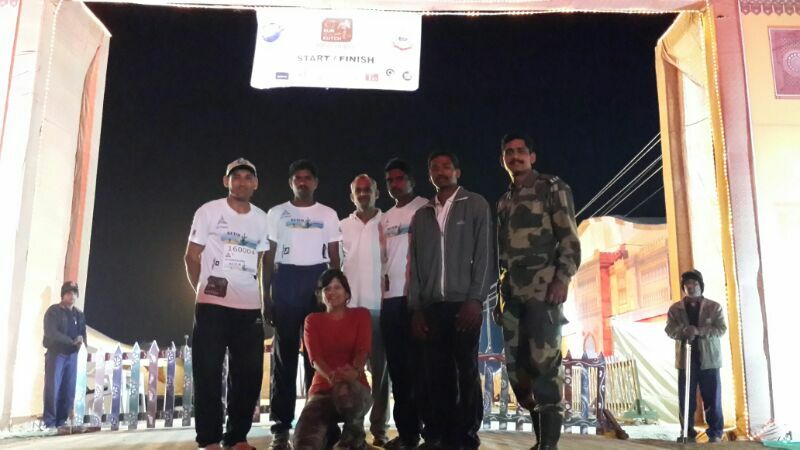 Commandant Sailesh Kumar of Gandhidham graciously flagged off the race on the morning of 15 March 2014 at 7:26am. The best runners from BSF clocked a very impressive time of 2 hours 07 minutes for a distance of 25 km, stopping barely for a quick sip of water at aid-stations and nothing else. To see these runners bear dry heat, hot winds and run at speeds so surreal is something that every ultra running lover will cherish and be motivated to race better the next time around. That we motivated more than just the regular runner is something that surely makes me smile! 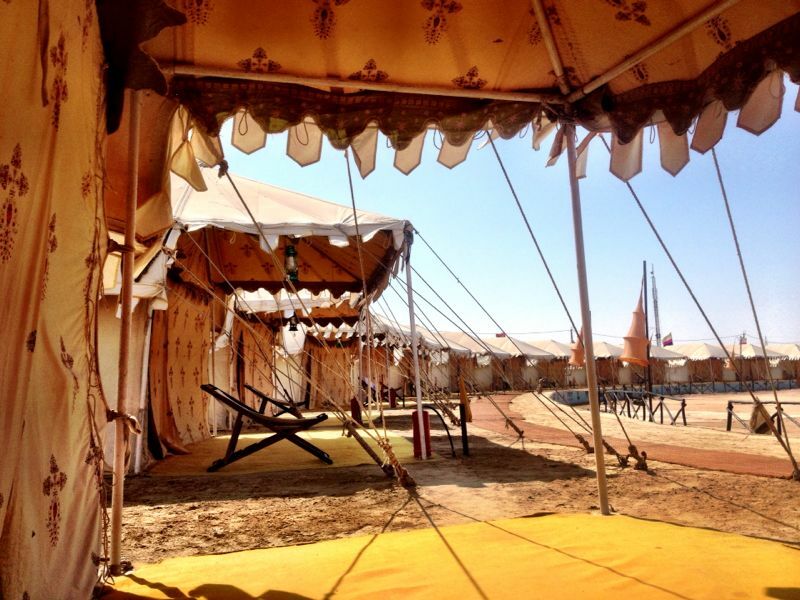 We will be back to this Rann with a lot more in 2015. Three cheers to an awesome team! Sucheta Kadethankar, the sole female runner in the race, sprained her ankle and had to give up just 4 km before the finish line. She was running in the 50 km category. A true ultra runner’s spirit is what it takes to be able to quit and walk away smiling, with a promise to come back. 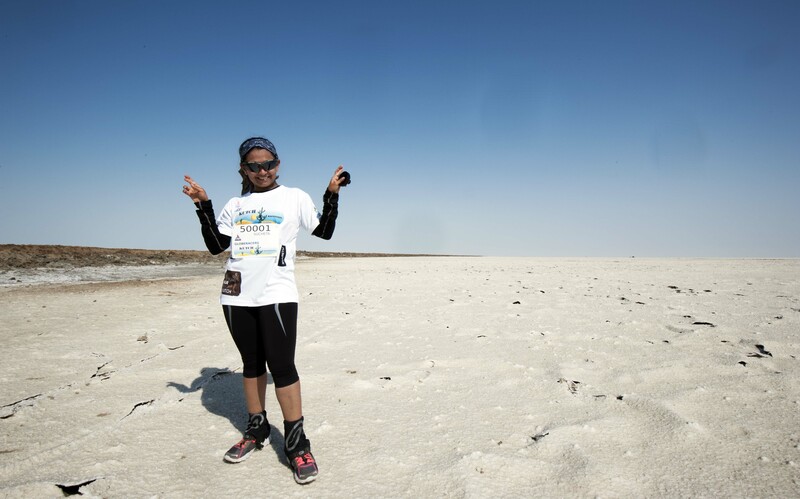 There could be no doubt that she felt a twinge of disappointment after braving the desert conditions and running 46 tough kilometers before being forced to quit. We do what we do because we have runners like her motivating us to create races which celebrate the vibrancy of the place, showcasing its culture, beauty and diversity that only India boasts of. 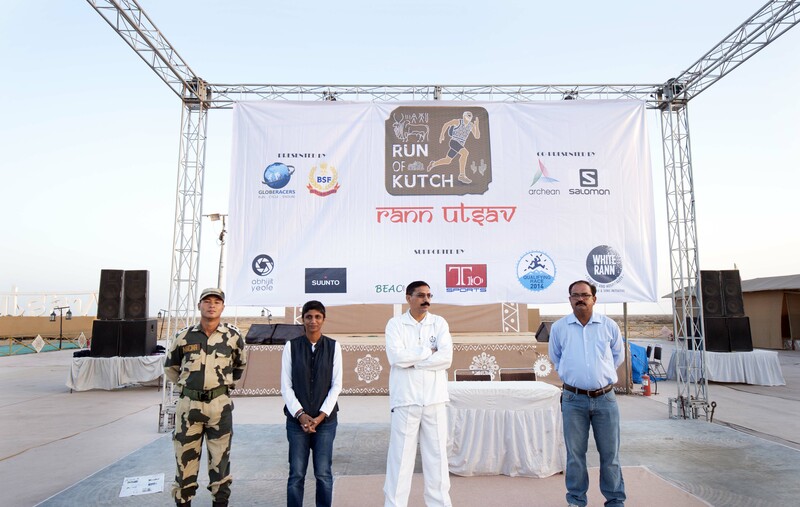 Sucheta Kadetankar, the sole female runner in the first edition of the Run of Kutch. 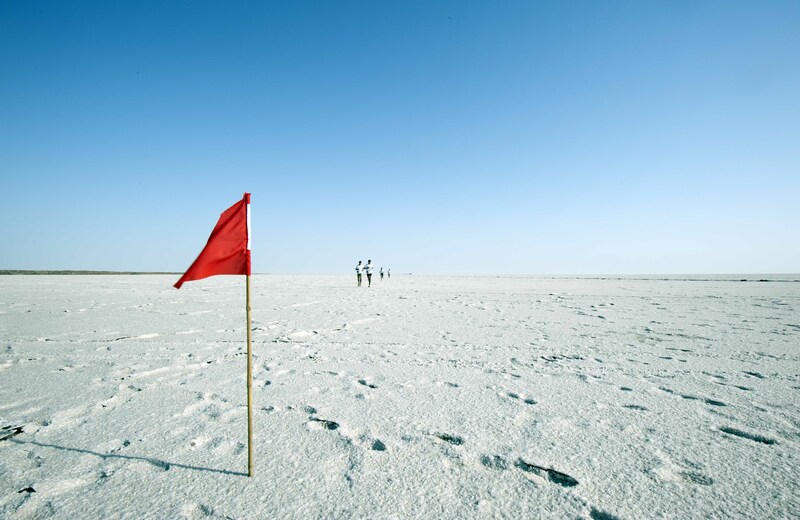 The first edition of the Run of Kutch concluded when the last of the runners, Breeze Sharma and Bhupendrasing Rajput reached the base camp on their return from the White Rann, the last and the tough section of the route that they had to manoeuvre while the sun was at its peak and heat radiated from the salt pans. At 7:30 pm, the event concluded when the Deputy Inspector General, Mr Arjun Singh Rathore, BSF Bhuj, gave away the medals, along with Commandant Mr Sailesh Kumar, and Mr Ajay Agarwal, CEO of the White Rann Camping and Hospitality, and Mr Atul of Green Apple. There were cash prizes and Salomon shoes to be given away to the first three finishers in each category and the BSF’s relay team, along with medals and a great shared meal that was a treat to every participant and supporter. Post dinner there was entertainment in the form of local music and some foot stomping Bollywood music! 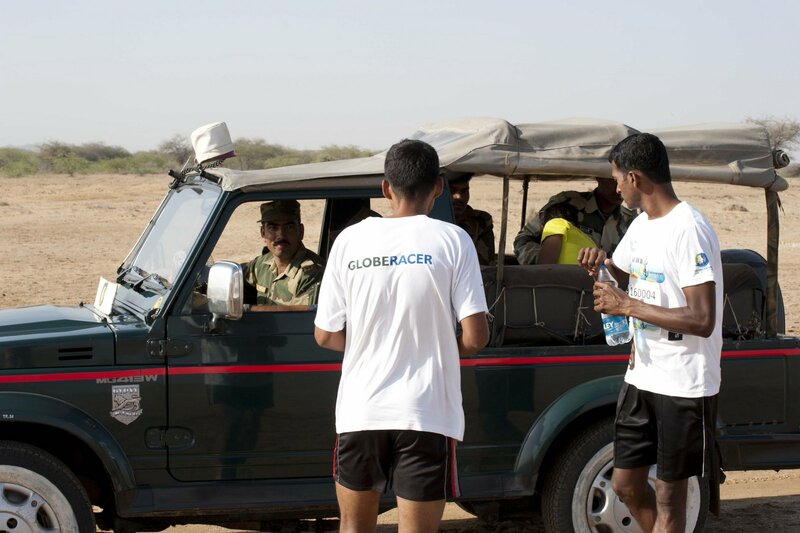 DIG, BSF Bhuj, Arjun Singh Rathore, giving away medals and prizes to the finishers of the first edition of Globeracers’ Run of Kutch. On that note, we express our gratitude to Archean Group, BSF, White Rann Camping and Hospitality, Salomon Shoes, Suunto watches, T10 Sports, Agrocel and our photographer Saify Naqvi for being such enthusiastic supporters of the event. Picture Credits: Saify Naqvi, unless otherwise mentioned. Great write up Kavitha! Very interesting to read it all from the race organizers perspective. Most people don’t realize what it takes to put an event like this on, the nerve wrecking moments when the markings don’t work (which always happens), the hours without sleep, and the inability to ever switch off (which runners can do when they are being looked after at aid stations, for the full duration of it all. Kudos!